Strategically placed bales of barley straw can help control filmanetous algae in freshwater lakes. Read more. 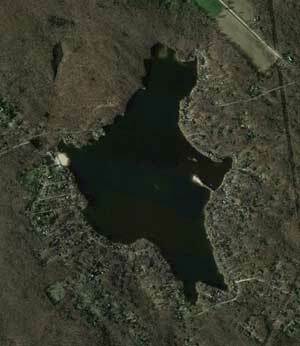 Amston Lake is a 184 acre lake located in Eastern Connecticut. It is considered a private lake, as it belongs to the 700 residents of Hebron, Lebanon and Amston. It is administered by a legal tax district board consisting of nine members who are appointed by the residents. The district levies taxes for operating expenses. Barley straw bales placed in Amston Lake in the early spring have helped control filamentous algae. 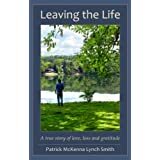 I purchased lakeside property in 1992, and have been involved in lake activities ever since. As time went on, filamentous algae became an ever increasing problem. We did not know why it was increasing. We do encourage the use of non-phosphorous fertilizers on lawns; discourage feeding ducks and geese; and discourage geese from nesting at the lake. The Amston Lake District has ordinances against using all types of gas motors on the lake. Around 2005, the algae condition became more serious. The Board looked at many solutions for combating the algae from chemicals to aerating the water to electrical means. None seemed to be appropriate for our lake. Some were solutions for larger lakes. and others were meant for small ponds. One board member did some research, and read that barley straw had been effective in some waters. Since that seemed to be a relatively environmentally friendly approach that would not detrimental to the lake, the board decided to try the barley straw method. The lake manager searched for sources of bales of barley straw. He found a source (which is no longer available.) Other sources have limited supplies of straw, so the early bird gets the bales. The CT Dept. of Energy and Environmental Protection does assist buyers in locating a supplier. In 2006, we purchased 60 bales of barley straw. We separated the bales and stuffed the straw in onion bags. We tied the bags to ropes anchored with concrete blocks. In late May, we concentrated about 30 bags in critical locations close to the shoreline, where streams enter the lake. The rest of the bales were put in various locations around the lake. In about a month, the bags started disintegrating and the straw became loose in the water. Because they broke up, we did not try again that year. In the following years, we tried a different type of bag, but experienced the same problem. After much experimentation, we concluded that the straw had to be put in the water as soon after the spring thaw as possible. It seems to take about two months for the water and straw to interact and affect the algae. In 2010, we put entire bales without bags in the water in early April, and again anchored them to concrete blocks. We found that single bales provide some local relief to the algae problems, but multiple bales work better. We only have five input streams (excluding storm drains) into our lake, since the watershed area is only about one square mile. Because the price of the bales was becoming prohibitive, we now place about eight bales around each input area and some single bales in areas requested by the residents (such as mine.) In 2012, we used a total of 25-30 bales. In September, we take the bales out and dispose of them at the local landfill. We have found that barley straw works quite well here at Amston Lake. My house is about 200 feet from one of our problem input streams. Before we started using barley straw, large clumps of black/green algae floated past my beach. Every day I would have to scoop it up in a net to remove it from the lake. Since I usually have only one bale outside my house, I still get some algae, but it is considerably less than what we had before the barley straw applications. I scooped it up twice in June of 2012. Since then, the algae has not been a problem. Based on the positive effects I have seen, I believe that barley straw has helped control the amount of algae forming in our lake. To recap, the bales work fine without taking them apart. They must be anchored with concrete blocks. Barley straw should be inserted as soon as possible after the spring thaw, and becomes more effective as the waters warm (over 70 degrees F.) Multiple bales must be used at strategic input areas. Since they are located close to shore (within 25 feet), they do not pose a problem for boaters. We put at least 5 to 8 bales in heavy algae areas supplemented with single bales placed randomly around the lake. In 2012, we used a total of 25 and 30 bales, in one application in early spring. If the input streams are large, bales can be placed directly in the stream. In September, we collect the bales and bring them to the landfill. Apparently scientists have not yet figured out exactly why and how barley straw helps control filamentous algae, but I can attest to its effectiveness. What's in your well water? If you experience problems with the website/find broken links/have suggestions/corrections, please contact me! The purpose of this site is to share information with anyone interested in environmental protection. Feel free to link to it, or to print hard copies for personal or educational purposes (see permissions) with a citation for the author. I have no responsibility or input on articles written by other authors. No permission is granted for any commercial use or reproduction online. Appearance of ads on this site does not constitute endorsement of any of those services or products! If you are interested in placing text links or other ads on this site, contact the webmaster. ©2007 Chimalis. Original photographs are copyrighted, and may not be used without the permission of the photographer. See disclaimer, necessitated by today's sadly litigious world.